Just for the packaging industry we supply a number of, to your specifications, custom tapes. •	Heat seal tapes, are tapes for which a strip of PTFE glass fabric is covered with either Masking tape or Glass liner tape on both sides. The standard version is supplied with on both sides 15mm and the, supplied by you, useful width. The self-adhesive strips can also be supplied in several other measurements. The 15 mm tape is pasted onto 5mm PTFE-glass and there is a 10 mm edge on either side left. With these 10 mm edges, you will be able to easily stick the PTFE-glass onto your sealer. Thanks to this your Seal wire can move freely under the PTFE glass fabric. There are several reasons why, in some cases, Heat seal tape cannot be used. The solution to this is to simply use our Zone Tape. With this there are two glue strips at the underside of the PTFE coated glass fabric. We can make Zone Tape in any desired form, all you have to do is supply the thickness, width and the usable width of the PTFE-glass. 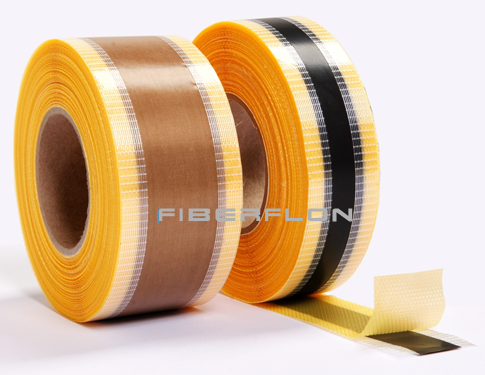 Heat Seal Tape and Zone Tape are supplied on rolls of 30 meter length.